If you entered my bedroom and saw my bed you would know that a woman sleeps there, and, if you didn't know I slept there as well, you would probably not be able to otherwise ascertain that a man does. I suspect that this is true in most married bedrooms. And, we don't care, husbands that is. One of the decorative choices that my wife has made is to add some additional pillows to our bed. We don't sleep on them so every night we remove them from the bed and every morning we put them back on. I'm not sure what purpose they serve, especially since no one else sees our bedroom, but they make Cami happy and that's what I'm all about. I am pretty creative, at least I think so. And there's at least one thing I am EXCELLENT at: teasing other people. And I often remind Cami that those I love most I tease most. How do I do that? Yep, you guessed it. I throw the pillows at her. I try to wait until she least suspects it, then, WHAM. Pillow in the face! She loves it (usually). And most importantly she knows that I love her. 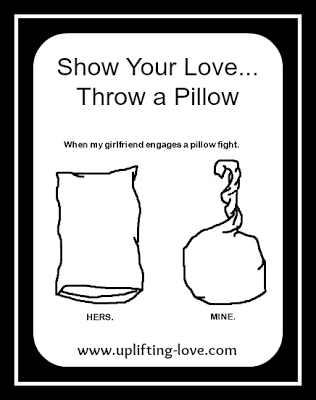 What do you do to show your spouse you love them? I would love to hear about it. Share it with me in the comments. The cheese thing really drives me nuts. You're so much fun! I love you! Linking after you from I Choose Joy! Obviously you choose joy. Yeah I had tried something similar, My wife doesn't like me in the kitchen, but since we were on a visit to my parents house, so I was helping her make noodles and for some reason, I don't exactly recall, I stuck a noodle on her hair. That night the left over food that was not fitting fridge, was decorated on my sleeping mattress. You can expect what had happened later on, as we both had to take a shower, and sleep on the floor. That's awesome!! I'm glad that you and your wife have so much fun. Thanks for sharing that idea!